Hundreds of years before the Toralii attacked Earth, destroying the cities of Beijing, Tehran and Sydney, before they developed the voidwarp technology and destroyed their homeworld, they warred amongst themselves. The hills of the occupied Kaater Mountains were home to thousands of prisoners. A 1900 word story set in the Lacuna universe suitable to read as a stand-alone story. Each of us has asked that question in dark, honest moments. Eight solid reasons to give life one more chance. Eight reasons your life matters. Join John Herrick, author of the novels From The Dead and The Landing, and discover fresh purpose for your life. For readers who enjoy best sellers by John Maxwell, Joyce Meyer, and Joel Osteen. Bigger than Impossible by Lydia Chorpening. Free on 12/28/13 Impossibility is not a period at the end of faith’s sentence. Faith, in the life of the believer, is meant to be tested. Without adversities faith will never become strong and overcoming. God has not planned crises, pain and disaster to enter our lives as a dead-end to faith’s venture. Many situations vaunt themselves as “impossible”, but when they are stripped from their “I” and “M” and become dependent on God, they become “God-possible”. •	Live life victoriously as you learn to rely on God. •	Learn how to overcome all life’s obstacles. •	Watch depression and anxiety disappear. •	Understand why God is allowing you to experience mountains. Each chapter of Bigger Than Impossible highlights a specific area of Lydia Chorpening’s difficult past, and contrasts it with Scriptures which make God bigger than the seemingly impossible. By utilizing the complete assurance of these Biblical concepts you will develop your trust in the God who is bigger than impossible. I was born in Iowa and raised in a strict Amish home and as Joseph, have seen my purpose in life fulfilled in most unexpected ways. From my humble beginnings, as Joseph, I saw my dreams ultimately fulfilled in my ‘Egypt.’ My husband and I were missionaries to the Philippines for eight years, and as Joseph, we were no saints at the beginning of our journey; needing to allow God to mold us into His perfect will. We traveled to remote areas, crossed turbulent oceans and trudged dangerous territories, learning to trust God as we went. This ebook is offered free of charge on your Kindle, Nook, and Ipad. Enjoy this free Christian Ebook, and share the good news with anyone willing to listen! Through terms one can understand, I am always searching for analogies that represent how one can live in the world, but not of the world. Learning how to use the tools given to us, as adults, in order to assimilate our mission with His will can be challenging to say the least. Sometimes it is through a simple message – through a means more familiar – that we can find just the right concept. And it is through Drew’s Dancing Drum that not only adults, but children especially, can experience a strong yet simple message and find comfort in our omnipotent and merciful God. 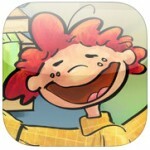 An app for iPad and iPhone, Justine Danielle Del Monte and Brandon Chappell bring a fun and engaging story to your home. In 12 slides, a lasting impression is sure to be made on your little one – in addition to yourself. Follow the story of a boy who has so much fun and joy with the toys he is afforded, but yet learns that it will take much more than materials to reveal light when times become dark. Simple themes, music, fun and even animals: good things of this world are everywhere, but nothing can fully bring us happiness but Him, and so this app illustrates (literally!) that one should not take for granted His love and gifts to us. In addition, it displays forgiveness, honoring and trusting your parents, and the presence and importance of family. What better way is there to send these strong messages to our Children, who are the future and the true blind followers of our Lord? The use of engaging apps that take advantage of the modern technology comes full circle with the simple download of a free app to your iPad or iPhone. It is only with God that anything is possible, and Drew’s Dancing Drum will give your young child a clear picture of how the love that Christ fills us with can impact one in the most basic of ways. It will remind you, also, that there is no need to look too hard for Salvation. The answer could be as rudimentary as a boy’s dancing drum. A few points on the technology: great graphics, age-appropriate wording and fun music. I loved the functionality of clicking on the puzzle piece to go back to a specific slide. Also, I’ll reveal a hint: click on the title at the beginning for fun acoustics. And finally, at the end, discover a quote from Psalms. 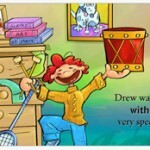 I won’t spoil everything, so you must download Drew’s Dancing Drum to discover the final message the author is trying to convey! View the developer’s web site, Charter Road Productions Inc.
Kindle Free Promo – The Prophecy of the Sacred Cross!